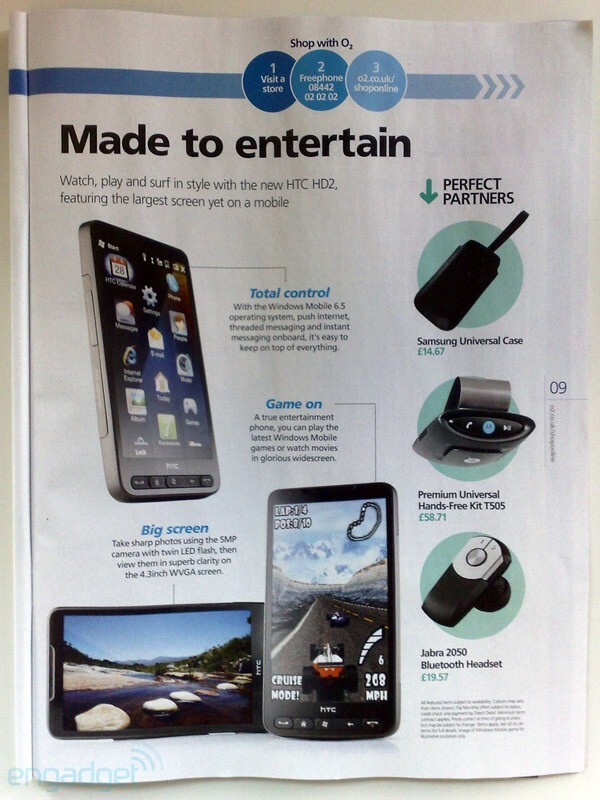 We've been furnished with the above page from an O2 in-store catalog detailing the HTC HD2 (aka Leo), which was set for a UK release on October 12 (though we're hearing that may have slipped to the 26th). Interesting that it's pictured with a stock Windows Mobile 6.5 UI instead of TouchFLO 3D. Is O2 rushing HTC's new hotness out the door in response to losing its iPhone supremacy? Or did an absent-minded employee just slip out the catalogs ahead of time? We're getting in touch with O2 to find out and will update with more details as we get them. For now, check out the full catalog page after the break. Update: After O2 stonewalled our phone enquiries, we decided to drop by our nearest (which was still annoyingly far away) store to have a look for ourselves. Alas, we only found September issues of the catalog, and the above snapshot is from the October iteration, which sports a big fat Pre promo on the front. So, anyone else seen an advance copy yet?